I'm trying to be more organized about my recent Annick Goutal and Diptyque sample vials. (For that matter, I'll likely revisit my previous Etro ones as well.) I tend to be lazy. If I get an even slightly negative first impression of a scent, when I have so many others to play with, I tend to not try it again, and that's not truly fair. Too awful on me to even bother trying again. Diptyque Philosykos. This ended up smelling almost like Youth Dew on me; it just did not agree with my body chemistry. Annick Goutal Passion. This didn't agree with me either. It wasn't as sweet as its description on the Annick Goutal site: "Tuberose and jasmine from Grasse blend with vanilla to create the warm and heady scent of a sensual and captivating woman." Tuberose, jasmine and vanilla sounded almost too sweet and heady to me, but this...I don't know. It's not bad, just not what I expected. Annick Goutal Les Nuits d'Hadrien EDT. 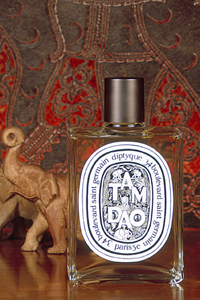 If memory serves, the EDP smells yummy, but the EDT is too faint to bother with imo. Everything else, except Annick Goutal Gardenia Passion and Rose Absolue. Gardenia Passion and Rose Absolue both smell good, don't get me wrong, but they're both soliflore scents, and I don't see myself buying them. You'd have to be a complete gardenia or rose fan, respectively, and I'm not enough of a fan of either to buy.